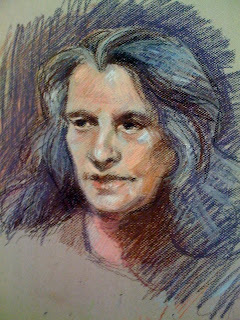 I saw this woman on TV and thought she had a very interesting face for a quick pastel sketch. I enjoyed this sketch very much...the planes of her face are so well defined, you can really feel the dimension in the drawing. Great work. Dan, thanks for stopping by and for the link. Beautiful! Are you going to post more work from your classes? You make it looks so easy....and it's not! Great technique....very skillfully done. Thanks Kim. I will try to do something worth posting. The last two pieces were pretty bad. Thanks for the nice comment Ry.